If you’re anything like me, you think you’re going to remember what the cryptic little markings mean so you don’t book mark the link, or save the pdf and get back to it. Then a few days later you have no recollection whatever of the information that you searched for, read up on, and sorted out. So you have to do it again. Well, I ‘ve done that a few times now and I’m tired of it. So I decided to make myself some cheat cards to file with a couple of others I’ve made recently and pull out whenever I need them until such a hypothetical time arrives when I actually remember what does what without needing assistance. I figured it’s unlikely that I am the only person in the world who is frustrated by finally getting down to work, only to be drawn back to the inter-web to get some “information” and then the sun has gone down, time is up, and nothing’s been done (but to be fair, it is all actually turned on.) To help banish this erstwhile activity I am sharing these cards with you now. 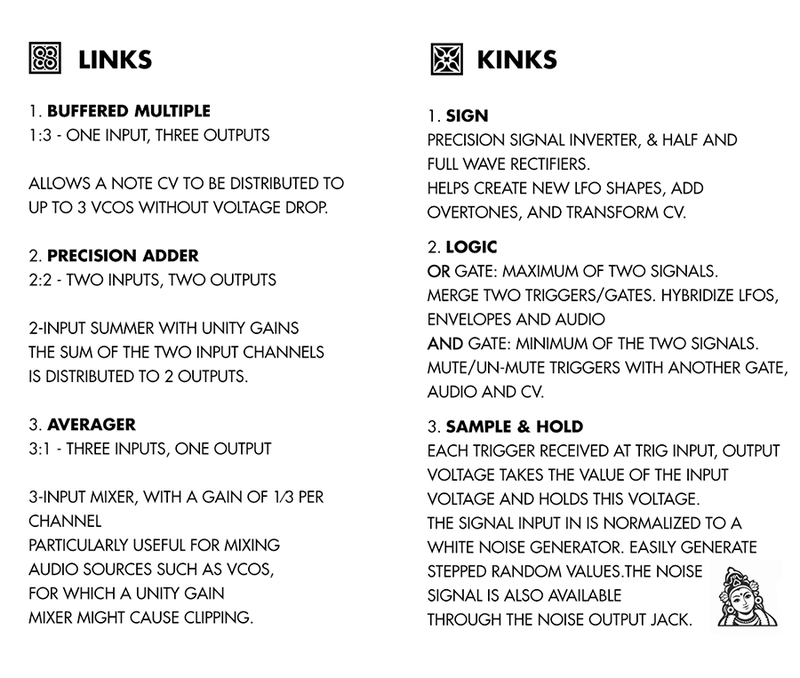 I’ve made up a cheat card for the Mutable Instruments Kinks and its sister module the Mutable Instruments Links. They’re simple, small, but extremely handy utility modules which have added so much to my sound design, and musical exploration. NOTE: BY DOWNLOADING THIS FILE, OR EVEN GRABBING THE JPG (BECAUSE THAT’S REALLY STILL DOWNLOADING ISN’T IT) YOU ARE AGREEING THAT THIS IS A FREE DOCUMENT. IT MAY NOT BE COPIED, REPRODUCED WITHOUT CREDIT, AND IT MAY NEVER EVER EVER BE SOLD, TRADED. THIS WAS MADE FOR EVERYONE, FOR FREE, AND SHALL AWAYS BE FREE. IF YOU CAN’T AGREE TO THIS PLEASE DON’T DOWNLOAD THIS FILE. IF YOU CAN AGREE TO THAT, THEN PLEASE ENJOY! Provided you aren’t opposed to the terms of the download, you can just grab the JPG from the top of the article if you want, or you can download the PDF format file and print it out for yourself. The format is supposed to be 3.5 x 2″ per card – print it double and fold it over into a handy little card. Now I always remember without getting sucked back into the inter-web which one of these is the precision adder, and which one is the AND logic.